Roses & Recommendations are very important as they allow you to unlock new areas for your restaurant. 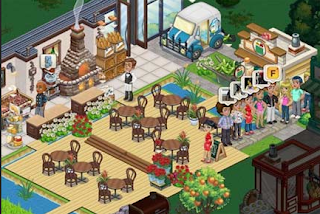 The faster you expand your restaurant, the more customers you can have and the further you can progress through the game. Note: After Reading This Guide Don't Forget Your 5 Free Ingredients From The Test Kitchen! #1. Collect From Rose Stand- First you must buy the Rose Stand from the Marketplace. Each time you collect from your Rose Stand you will be given 3 roses. Every 8 hours you will be able to collect these roses again. This is one of the best ways to obtain Roses in ChefVille. #2. Get From Friends- When you do not have any Roses left, try to collect recommendations. You will see a screen selling roses or ask you to "request". Click request and you will be able to request roses from your friends. In most cases the more friends you have the more total roses you will receive. #3. Buy With Cash- This is the third and most costly way of obtaining roses. You can simply buy roses for In-Game Cash (Which can be bought for real money). I would first try #1 or #2 and use #3 as a last resort because no one likes paying for virtual items. The choice is yours though. Recommendations are necessary for unlocking new areas in ChefVille. To get recommendations you must spend Roses on customers. When customers come into you restaurant they will sometimes have a Rose icon hovering over their head. This can only occur when you have food to serve to your customers. Once you spend a Rose on your customer it will cost your 1 Energy. So make sure you pay attention to your energy levels when trying to obtain recommendations. Also note that there is currently a 100 maximum limit recommendation for each ChefVille player so use them wisely. Please comment below if you feel there is anything else important to note about Roses & Recommendations in ChefVille. Thanks For Reading! Thank you for the information Daphne regarding recommendations for Chefville. How to you obtain the rose stall in the marketplace when it is still locked??? I have been playing for approximately one month now and cannot move around the Cafe or complete goals without expanding. Place is now a mess. Please advise. I Don't seem to be asked for roses by the customers, does that start at a certain level? I have roses and the recommendations icon at the top. but I never receive any. my customer dont have the little rose hoveringover them. how come?